A colour slide of an aerial view of Whitby looking west. In this view Highway 401 is at the top of the photograph. 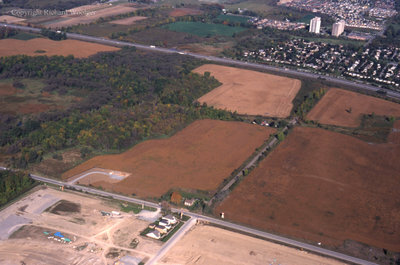 The Whitby Shores subdivision is at the bottom of the photograph. Aerial View of Whitby looking West, October 7, 1998, Richard Woolger. Whitby Archives A2014_014_022.